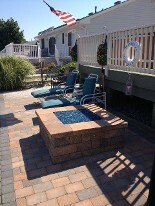 Some Of Our Work! We can do custom burners as well. 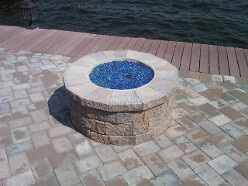 Square gas fire pit with ocean blue reflected glass. 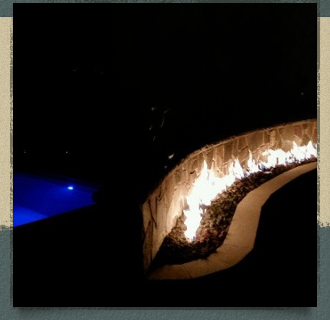 This Square gas fire pit has ocean blue reflective glass aand a 24" double gas fire ring. This unit is a manual match Litete unit. There is so many options with finishing off your out door space, from glass, gems, and logs it is up to your imagination. Round gas fire pit with aqua blue reflectivective glass. This unit is a round 12" fire ring with aqua blue glass, and with a push of a button you have a nice fire. Unit has a remote control to turn it on and off. Sit back and relax. Round fire pit 12" burner reflective black glass. This unit has a 12" double stainless steel gas fire ring, with reflective black glass, unit is manual match lite unit. 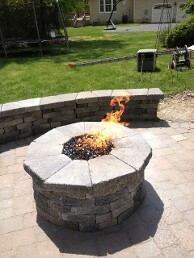 The fire pit was designed to match the sitting wall in the back ground. So as you can see you can do just about any design you like. Call Today we will come to you!